The festive season and lead up to Christmas can often cause a lot of undue stress. Coupled with cold weather and a time when numerous people are struck down by winter colds, it can be a challenging few weeks. We’re firm believers that gardening is the perfect antidote to Christmas-related stress and what better way to combat stress than by bringing a real tree into your home? 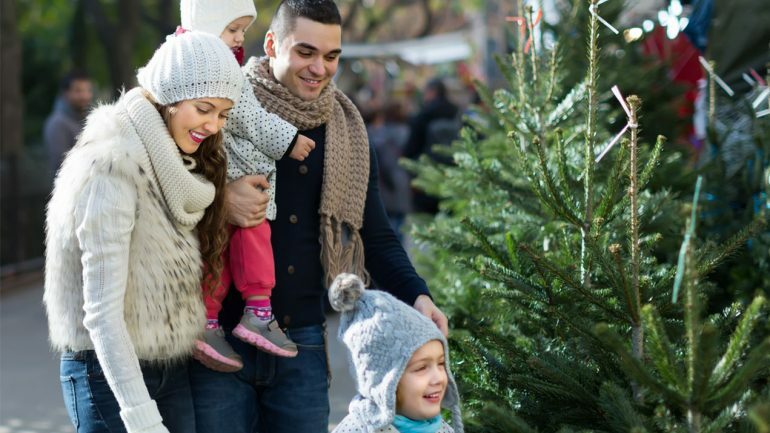 Real Christmas trees are proven to have a beneficial effect on health and wellbeing when added to a living space. The aromas of traditional evergreen fir Christmas trees have a soothing and rejuvenating effect, helping to clear the airways and breathe more freely. Research also shows that introducing holly into the home can help ease hypertension and high blood pressure. A real tree is the centrepiece of the season; there’s just something about the scent of the fresh needles. This year, we have Nordmann cut trees on sale, as well as a selection of pot-grown species, including Norway Spruce, Blue Spruce and Fraser Fir. Being pot grown, these have good needle retention if properly watered. Real Christmas trees can drink up to 2-3 pints of water per day, especially if kept in a warm room. Gardening in general can help achieve mindfulness and enhance your wellbeing. Simple, manual tasks can help calm the mind and lift the spirit. So we suggest you take a break from Christmas planning, shopping and wrapping and enjoy some peaceful time in the garden. Real cut trees are now available to purchase at Haskins. For those that prefer artificial trees, these are also available.